The Rotator Compost Tumbler and Rotator Compost Tumbler Jr. The Rotator Compost Tumbler takes the backbreaking effort out of turning your compost. You won't need to struggle with forks or shovels, trying to tear apart a packed, root bound, brick of material. 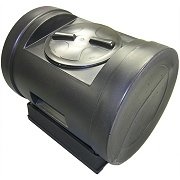 The large capacity compost drum rotates on a stable base providing quick and easy mixing. Just turn it about once a week to keep oxygen, nutrients, microorganisms and moisture evenly distributed throughout the developing batch. The Rotator Compost Tumbler arrives fully assembled so you won't spend frustrating hours putting it together, and it's low-to-the-ground profile means you won't need to lift materials high in the air to fill it. With this simple design, you can begin turning your garden and kitchen waste into valuable organic soil in just weeks. Recessed handles on sides of drum provide easy turning action. Handles act as agitators on inside of drum to help mix batch. Low to ground for easy filling. No heavy lifting or spilling messy debris while trying to fill. Load bearing points on base allow composting drum to rotate freely, while base keeps drum cradled for easy rotation in place. Large 16 inch twist lid for loading large batches, closes securely to prevent access from animals or pets. 72 aeration openings on ends allow air flow within batch, and quick composting action. Door fitted with 2 way vent. Rich black color retains heat from sun for quicker composting. Made from 100% recycled polyethylene plastic. Doesn't leach into your compost! Favorable composting conditions can turn garden, yard and household waste into nutritious plant fertilizer in just a few weeks, and a well mixed compost batch enhances the interaction of ingredients and microbes to speed nature's process. Turning your compost increases air circulation and distributes material and moisture evenly - two important parts of the compost equation. We’ve created the Rotator Compost Tumbler to help make your composting efforts easier. With stationary composters, material is added in layers, and “turning” the compost pile is difficult and often a smelly, messy project. As ingredients are added, layers pack down and germinating seeds produce fibrous roots throughout the stack. These roots lock together forming a brick of matter that’s hard to break apart - even when the batch is finished. These stagnant layers can keep hot (biologically active) and cold (biologically inactive) areas from digesting for long periods of time. By placing the rotating bin of the Rotator Compost Tumbler on it’s base, you’ll be able to turn your batch without the backbreaking task of moving material with forks or shovels. Frequent turning greatly speeds up the composting of materials and also prevents “germinating roots” from “webbing” the batch into a solid brick. Use about 1/3 green, and 2/3 brown ingredients. This recipe will keep a good heat/moisture level for optimum organic reaction. Moisture of compost should be similar to that of a damp sponge - too much water cools the batch, and too little reduces micro-biotic action. You can add water or green materials when too dry - add brown materials if too wet. Grass clippings add heat and moisture, but too many will make a wet, stinky mess. Add them carefully (you also can let them dry a day or two before adding). Never add animal products such as meat, milk products, bones or eggs (washed egg shells are the exception). Although cattle and horse manure are good additives, never add pet waste to your compost. Add a handful of dirt about once a week to introduce new microbes that will act as "compost activators"
Turn your compost. Mixing compost will distribute moisture and materials evenly, and circulate air within the batch. Do this whenever you fill the composter, and about once each week. Your compost batch will shrink as it breaks down, and you can continue adding materials until the batch becomes too heavy for turning. Stop adding new material to your composter about 2-4 weeks before you plan to remove your finished compost batch. The Rotator Compost Tumbler arrives fully assembled and is backed by a 1 year manufacturing defect warranty. Please allow 1 to 3 weeks for delivery.